If have questions, please either email us by clicking on the email link below or call us at 678-971-9390. We appreciate the over 20 Banks County veterans who attended our breakfast on Saturday, March 30 at the historic courthouse. A good time was had by all. The event also served to renew friendships and talk about a wide variety of topics. Huge thanks go out to Wie's Commerce County Cafe for providing the biscuits for the breakfast. On Saturday, April 13 from 1-4 pm, the Banks County Historical Society and the Banks County Public Library will hold Genealogy Day 2019 at the Banks County Public Library. The library closes to the public at 1 pm on Saturday, so please plan arrive before that time. Attendees will have private access to the many genealogical resources, both in print and online. Dr. Walter J. Freeman, a genetic genealogist, will be present to provide answers to your questions about genetic genealogy. We encourage those who have had DNA testing done to bring their results. This is a free event which is open to the public and is presented in cooperation with the Banks County Public Library. The Banks County Museum is looking for photos taken before 1950 of the historic courthouse. You can bring your photos to the historic courthouse to be scanned on any day that the courthouse is open to the public. 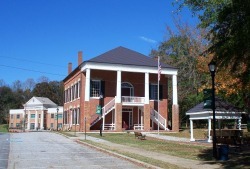 Contact Museum Director, Mellisa Dalton at 706-677-3693 for details. Effective the week of April 1, 2019, the historic courthouse and museum will be open to the public from 10 am to 4 pm on Thursday and Friday of each week. For information or group tours, please contact Museum Director, Mellisa Dalton at 706-677-3693. Due to the increasing number of calls, voicemails and email messages received, we need to be sure that everyone is aware that the Banks County Historical Society is not the same as the Banks County Historical Commission. The historical society is unable to take messages for or pass along information to the county's Historical Commission. If you need to contact them, please call the Banks County Commissioner's Office at 706-677-6800. Regrettably and due to numerous complications and setbacks, the DVDs have not been manufactured. We are still hoping to be able to offer the DVD for the price of $10 (add $5-$7 if mailed). Remaining unknown is when the DVDs will be available. Once available, DVDs will be sold as cash-only purchases made at the historic courthouse and museum. The disc will be printed (as shown) and will include a clear plastic slim case. The DVD will include each character's performance during the tour. There will be bonus material too. For example, a story told by a character that was unable to participate when the walking tours were held will be included. Additional updates about the DVD will posted here and on social media. To reserve a copy of the DVD, send an email message to BanksCountyHistory@gmail.com with "DVD" (without quotes) as the Subject line, or call 678-971-9390. No advance payment is required, just provide your email address and phone number and we will notify you when the DVDs become available.